Choosing the right color for your bathroom can be quite a task. There are many options out there, and each direction could give a whole new vibe to your bathroom. The color of the bathroom walls and accessories can provide a sense of openness and space, or conversely, it can make your bathroom look classy and minimalistic. Read on to learn more about a few color ideas you may want to try. 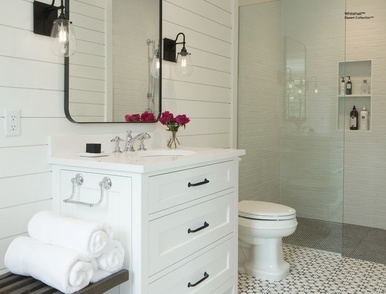 If you are looking to give a clean, bright and traditional look to your bathroom, look no further. White is a particularly welcoming color, which gives off a sense of hygiene and cleanliness most people love. Matte Black is classic, minimalist and intimate. This color tone could be the best choice if you are seeking a more luxurious vibe. On the other hand, the darker color palette can even add a more intimate effect to your bathroom, if you want to transform it into a cozy nook. Jewel tones can really give your bathroom a luxurious and regal feel. This is a perfect choice for a premium bathroom, and it works well in combination with mirrors, porcelain, and other high-end materials often found in lavish bathrooms. Yellow has a vibrant, cheeky and old-fashioned attitude. This is particularly perfect if you want to add warmth and depth to your bathroom, away from the usual stereotypes and deeper into a more interesting texture. Blue/Gray hues have long been a favorite of modern interior designers, especially when it comes to bathrooms. The reason why these options are so popular is that blue/gray patterns are not as extreme as white or black and can be more adaptable in a wide variety of situations, being aesthetically versatile.